2nd Annual Urban Wilderness Canoe Adventure October 4th - 5th | Joe Hayden Real Estate Team - Your Real Estate Experts! There is nothing quite like the serenity of paddling slowly down the river watching the leaves fall and the 2nd Annual Urban Wilderness Canoe Adventure allows outdoor lovers to do just that. Friday, October 4th and Saturday, October 5th, families and friends can join Metro Parks and partners for a canoe trip down the Ohio River. This is a free to attend event, but pre-registration is required via Jefferson Memorial Forest at 502-368-5404 to reserve space. Canoes will be taking off from both Riverview and Shawnee Parks for participant convenience and in order to highlight more of the area’s beauty. The Urban Wilderness Canoe Adventure trips will be done with safety in mind. Journeys will be taken in 24’ and 32’ Voyageurs, which will hold between 9 to 15 canoers, along with a guide. Participants should wear comfortable clothing, appropriate for outdoor activity. No flip flops allowed and ice water will be available to those who bring refillable containers. Canoe adventures start Friday, October 4th at Shawnee Park, 4501 W. Broadway in Louisville on the north side. Take off times will be held at 8:30, 10:00 and 11:30 a.m., then again at 1:00, 2:00 and 4:00 p.m.? 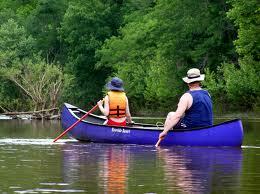 Saturday, October 5th canoe adventures will begin at Riverview Park, located at 8202 Greenwood Road in Louisville. Take off times will be held at 8:30, 10:00 and 11:30 a.m., then again at 1:00, 2:00 and 4:00 p.m.? Pre-register and enjoy the free canoe journey at the 2nd Annual Urban Wilderness Canoe Adventure on October 4th and 5th at Shawnee and Riverview Parks!